Shazam! is unlike any other superhero movie we’ve ever seen. Though it does at times suffer from the cliche superhero origin story that nearly every superhero origin movie has, its entertainment value is enough to keep things interesting. In fact, Shazam! at times seems to play off of these cliches by turning them into jokes, making it feel almost like a superhero parody like Deadpool or Teen Titans Go! To The Movies!. The hilarious performances by Zachary Levi (Shazam) and Jack Dylan Grazer (Freddy) add to this aspect of the movie. The best aspect of Shazam!! 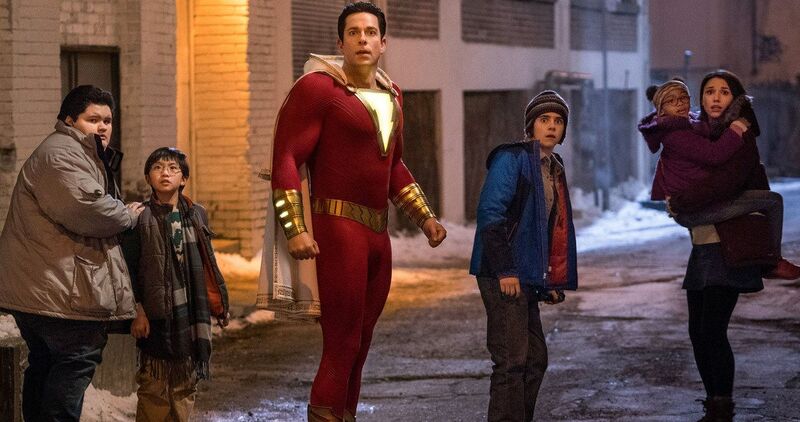 is that the movie focuses much more on Billy Batson’s transition into a superhero rather than setting up his fights against the villains, with Billy not meeting the movie’s main antagonist until about halfway through the movie. In the past, many DC movies like Batman v. Superman have put too much emphasis on the villain, making it more about the villain’s bland plot than the hero of the movie. Shazam! does not make this mistake, with almost every moment of the movie feeling representative of Billy’s character, much like Spider-Man 2. Much of Billy’s transition into a superhero featured Billy becoming accustomed to his superpowers through different experiments, such as trying to fly or turn invisible. While we’ve seen dramatic takes on superheroes learning their powers (ie, Man of Steel), Shazam! takes a much more comedic and realistic angle on the scenario in ways we have never really seen before. Because of this, Shazam! feels like a truly original superhero movie, which is something we seldom find after nearly 20 years of Hollywood being overcrowded by caped crusaders. Shazam! subverts the genre we have become accustomed to in ways that still manage to surprise the audience. The only place that Shazam! really disappoints is in the third act, which felt way too long. It felt as though the movie “broke into the third act” about six times, which did not flow very well narratively. While the final fight was certainly high stakes, it was rather clear who would triumph, so stretching out the final fight didn’t really add much to the plot. While there were still a few surprises in the third act, the movie would’ve been improved had they cut down the final fight 5 or 10 minutes, or simply written out a few of the dramatic beats. All things considered, Shazam! is without a doubt the most fun addition to the DCEU. Though it’s certainly sad to know that we may not see the Justice League assembled on screen for several years, the ending of Shazam! gives us something even greater to be excited about from this Warner Bros. franchise. Just be sure to wait until the end of the credits!